Design firm Snøhetta’s latest project is a forward-thinking library space for North Carolina State University. Called the James B. 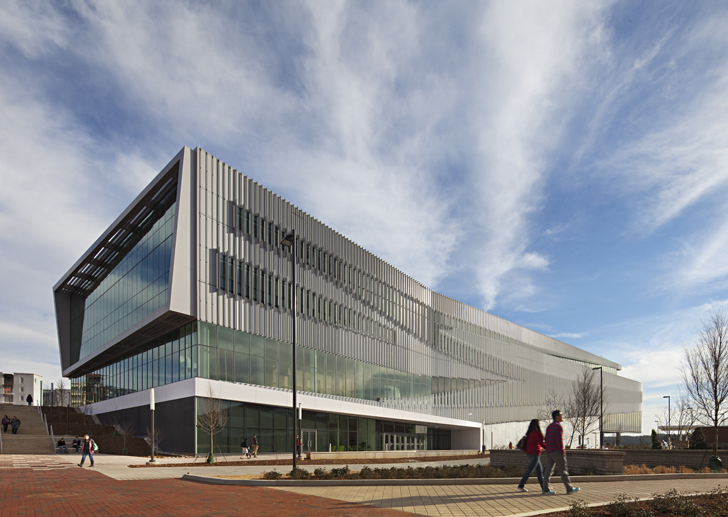 Hunt Jr. Library, the technologically sophisticated hub is destined for LEED Silver. Snøhetta designed both the library and surrounding landscape, creating an environment that emphasizes the natural beauty of the North Carolina terrain and creates a serene center in which students can study. The glass façade of the Hunt Library not only reflects the carefully landscaped trees on North Carolina State’s campus, but also flushes the interior with natural light, making for comfortable lighting in which to study. The fritted glass is covered with an aluminum louver-like system that directly blocks solar gain while filtering in ambient natural light, providing soft light to its interior. Several blocks of open-air spaces connect each floor of the library, including a bright open staircase that emphasizes the center’s modernity. Green technologies such as active chilled beams and radiant panels help to cool and heat while reducing energy consumption. This technology joins the superior state-of-the-art technology of the library’s robotic bookBot automated retrieval system. The incredible device can hold two million volumes in just one-ninth the space of traditional shelving, and is accessible through a software system called Virtual Browse. The innovative system allows users to browse through a virtual stack of books, giving students the tactile pleasure of the library in a fraction of the storage. Snøhetta‘s library is an exciting place to study and learn, giving students both the best technological programs, as well as the serenity of a traditional library. 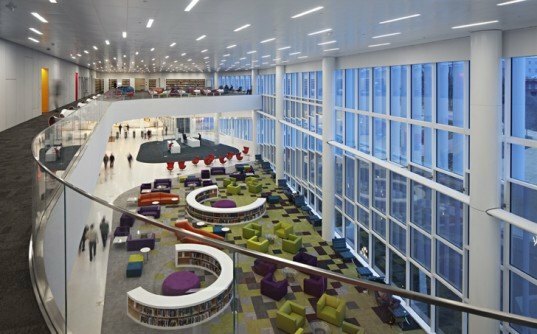 The glass façade of the Hunt Library not only reflects the carefully landscaped trees on North Carolina State’s campus, but also flush the interior with natural light, making for a comfortable study lighting. The fritted glass is covered with an aluminum louver-like system that directly blocks solar gain while filtering in ambient natural light, providing soft light to its interior. Several blocks of open-air spaces connect each floor of the library, including a bright open staircase that emphasizes the center’s modernity. Green technology like active chilled beams and radiant panels help to cool and heat without overly consuming energy. This technology joins the superior state-of-the-art technology of the library’s robotic bookBot automated retrieval system. The incredible device can hold two million volumes in just one-ninth the space of traditional shelving, and is accessible through a software system called Virtual Browse. The innovative system allows users to browse through a virtual stack of books, giving students the tactile pleasure of the library in a fraction of the storage. Snøhetta's library is an exciting place to study and learn, giving students both the best technological programs, as well as the serenity of a traditional library.